A new kids game is twisting, turning, and causing laughter in many backyards and homes. It is called Wobbly Worm Ring Toss and is one of the best outdoor games for preschool kids. The goal of the game is to through your 3 rings over the head of a work to win the game. However, this work is not an ordinary pole, it is a Wobbly Worm that bends and twists all over the place making it an entire new game. The kids will love it! The goal of the wobbly worm game is simply. Be the first to get all 3 of your rings over the Wobbly Worms head to win. There are 2 ways to play for kids of different abilities. For younger kids you can wait for the worms head as it passes and place it on. For older kids stand back and test your tossing skills and see if you can loop it around the worms head. This game is normally played as a free for all seeing who can do it the fastest. But when tossing to be fare you may want to have them alternating between tosses. But once that Wobbly Worm starts dancing and excitement is up many of the rules go out the window. Each Wobbly Worm Ring toss set comes with one Wobbly Worm, nine rings (three different sets of colored rings). Each Wobbly worm game comes with 3 sets of rings so it can be played with 2-3 players. The electronic Wobbly Worm game requires 2 batteries, not included. One thing we really like the design is that additional wiggly worm segments are included so it can to 3 feet in height! The taller Wobbly Worm gets, the more he wiggles and wobbles. This adds new elements of excitement and challenge for advanced players. Tube segments can be easily pulled apart to return Wobbly Worm to a lower height as needed. 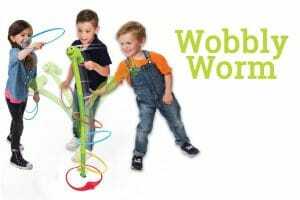 Wobbly Worm is one of those games that is interactive, builds hand eye coordination skills, and kids have a blast playing. From the moment you turn it on and see the wobbly worm dancing creates laughter and cheers of joy. It would have been nice if it came with an extra set of rings, so it could have been up to a 4-player game. But then may be too crowded. We do believe the game is not made with the best quality, and does fall apart easy. However, it is way too much fun and besides the downfalls should be added to the backyard games collection for any children. You will find Wobbly Worm featured in the Kids List of Backyard Games, Beach Games for Kids List and our Ultimate List of 68+ Outdoor Games. Game description: A new kids with a wobbly worm game twisting, turning, and causing a challenge to add the ring to the Wobbly Worm that keeps wriggling. The first person to put all 3 of their rings on the Wobbling worm, wins!